Christine DeRosa/Staff Photographer Graduate student guard J.C. Show contributed 10 points as the Bearcats’ hopes of a comeback came up short against Albany. 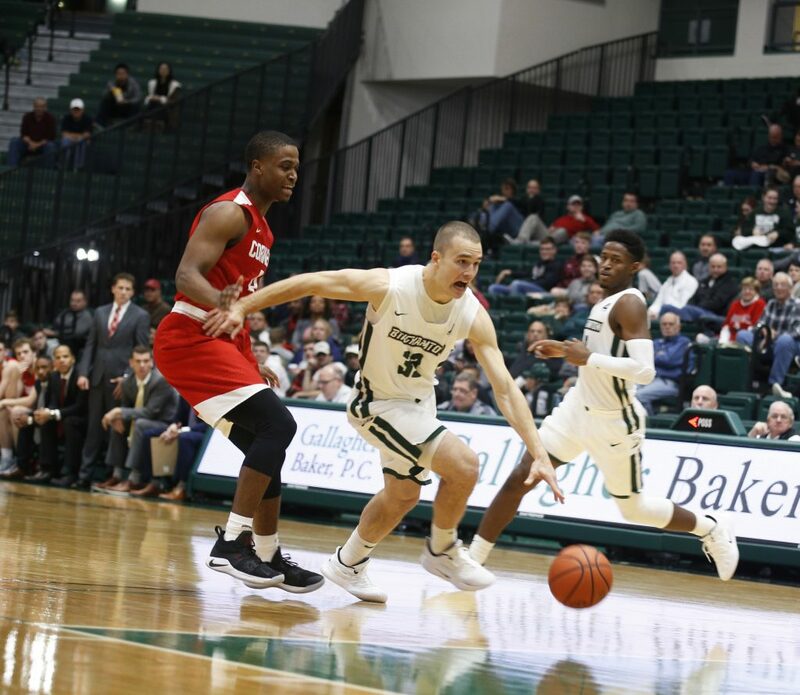 Eight minutes and 43 seconds into a matchup against Albany, senior forward Caleb Stewart drove in a jumper, and thus the Binghamton men’s basketball team was finally on the board. After trailing 19-0 to start the game, it took nearly half of the first period for Binghamton to score. The Bearcats (6-17, 2-6 America East) played from behind for the entire contest, eventually falling 64-50 to the Great Danes (8-15, 3-5 AE). Throughout the scoreless drought, Dempsey did not call a timeout, instead using the media break to speak to his team. After finally getting on the board, Binghamton went on a 23-7 run, cutting Albany’s lead to just three points. The teams headed to the locker room with the Great Danes leading 31-25. In the second half, the Bearcats were able to cut the deficit to four early on, but Albany pulled away, extending its advantage and ultimately taking the contest 64-50. Anyichie finished the game with 10 points, seven boards and three steals off the bench. For Albany, redshirt freshman guard Cameron Healy was the difference-maker. After scoring 12 of his team’s first 19 points, he finished with 31 points and 10 rebounds. In the first double-double of his career, Healy finished with a career-high in points and a program-record nine 3-pointers in the game. The 19-0 start by Albany jumps out as a particularly difficult way to start a game, but the Bearcats have been plagued by slow starts in several of their AE matchups, one of the many elements that has led to the team’s lack of success in conference play. While Dempsey is right that Binghamton has had to play the three best teams in the conference on the road, the AE season is at its midpoint, and every team in the conference has played the same exact opponents, facing all eight other teams once. In those three games against Stony Brook, UMBC and Vermont, the average margin of loss was nearly 17 points, with the team failing to score more than 50 points in any of the matchups. As the Bearcats prepare to face each of their AE opponents again, Dempsey and his team might need to rethink their approach if they want to turn their season around. Next up for the Bearcats is a home matchup against Stony Brook on Wednesday night. Tipoff is set for 7 p.m. from the Events Center in Vestal, New York.